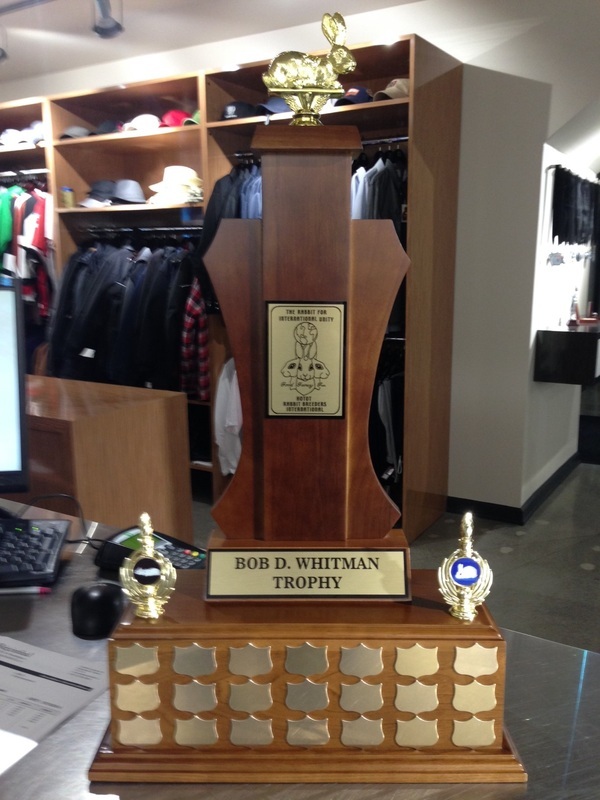 Since 2015, the Bob D. Whitman Trophy is presented to Open & Youth BOB winners of ARBA Convention & HRBI National Show. The recipients have their names engraved on the trophy. Bob introduced the Blanc de Hotot to the United States in July 1978. In October 1978, he presented 11 animals before the ARBA Standards Committee and in March 1979, the breed was accepted with the official Standard being printed in the Domestic Rabbits. It took only one presentation and less than 1 year to have a new breed accepted! Criteria have certainly changed since then for the acceptance of new breeds into the Standard of Perfection. Bob is the author of one of the most wonderful informational books on the origins of domestic rabbits entitiled Domestic Rabbits & Their Histories, in which he dedicated an article to the Blanc de Hotot. He also wrote for several periodicals, including the Rabbit council of New Zealand Newsletter, Fur and Feathers, and Domestic Rabbit, where we can find several articles of his about the Blanc de Hotot. In 2002, Bob's lifelong research led him to file a successful petition to include threatened rabbit breeds on the ALBC Conservation Priority List. He provided more than a decade of registration data for the various rabbit breeds; brief descriptions, development, history and distribution of the breeds; identified which breeds were developed in the United States, and which breeds are only to be found in the United States. When the first Conservation Priority List was finally issued in 2006, the Blanc de Hotot was part of the ten specific breeds that qualified for inclusion.